Over the summer, I became totally obsessed with this grilled summer veggie chopped salad. I made it once a week, on average. My friend Annie made a riff on it and turned it into a fajita chopped salad, and that went into my rotation as well. After the indulgences of the holidays, I've been reseting my diet, and I've majorly been craving that summer salad. Zucchini and corn aren't exactly abundant these days, and it's too cold and rainy to grill, thus a seasonally appropriate winter roasted veggie salad was born. Obviously you could use any combo of winter veggies here. I happen to love roasted brussels sprouts and cauliflower together, so I went with that. Carrots, butternut squash, sweet potatoes, onions, etc would also be lovely. Or maybe even try roasting some apples or pears! In lieu of the grilled romaine, I used a combination of chopped romaine and spinach. However, if I'd had any kale on hand, I would have used that. I think the hearty greens would work really well with the roasted veggies. This was even easier than it's grilled counterpart, since you don't have to mess with preparing the grill. 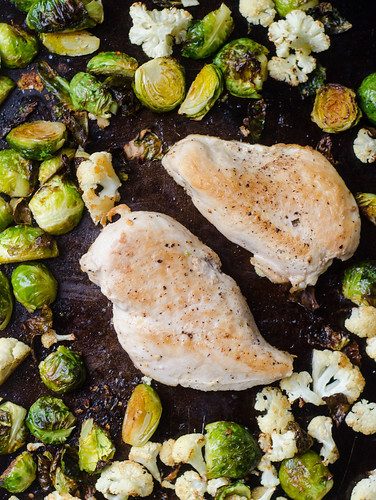 I quickly seared the chicken on the stovetop, then finished it in the oven with the veggies. I tossed it all together, along with some aged Gouda and lemon-garlic dressing. This salad totally hit the spot. The Gouda was an especially fantastic addition. I've made it quite clear that I'm a summer-lover and a winter-hater, but this salad definitely makes the dreary weather more bearable. I hope you enjoy it as much as I did! In a small bowl, whisk together 1/4 cup of the oil, garlic, 1/2 teaspoon of salt and 1/2 teaspoon of pepper, and red pepper flakes. 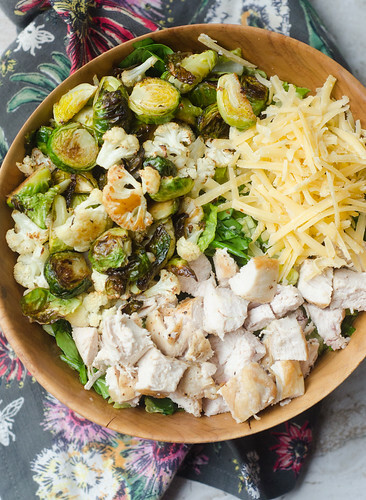 Toss the brussels sprouts and cauliflower with 1 tablespoon of this mixture, then arrange in a single layer on a rimmed baking sheet. Heat the remaining 2 teaspoons of oil in a skillet set over medium high heat. Pat the chicken dry and season both sides with salt and pepper, then cook 2 to 3 minutes per side, until golden-brown. Place the chicken on the baking sheet with the vegetables, and cook for 10 minutes. Turn the chicken over, stir the vegetables, and return the pan to the oven. Cook an additional 5 to 10 minutes, or until the vegetables are tender chicken is cooked through (check after 5 minutes, and take it out if it's reached 160 degrees in the center). Meanwhile, whisk the lemon zest and juice into the olive oil-garlic mixture. Season to taste with additional salt and pepper. Allow the chicken to rest for 5 minutes, then chop into large dice. 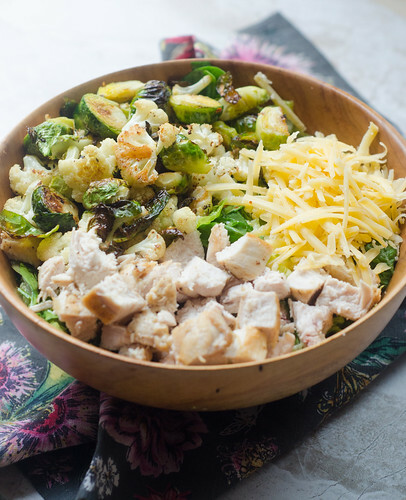 Toss the romaine and spinach with the dressing, then gently mix in the vegetables, chicken, and gouda. Taste and season with additional salt and pepper if needed, and serve warm or at room temperature. Love this idea! That summer version was a favorite here, too, and I can't wait to give this one a try. Delicious! Can be eaten in the summer as well, I think. Now THAT is a chicken salad! I agree with Jen. This is a year round salad. YES GIRL! This is so perfect. I love salads that feel indulgent, but really are packed with nutrients. I can totally see myself roasting up a big pan of winter veggies and tossing it into salad like this throughout the week! Definitely the ULTIMATE in healthy winter meals! That's exactly what I did! And I even had a bowl of them for breakfast with a runny egg. It was so heavenly. Me too! So often salads are calorie bombs, but I really tried to make this on nutritious and light! I always think of you guys when I make the summer one since you were here when I made the zucchini/corn salad that inspired it! I'm kind of the same way. I definitely crave soups more in the winter. But the flavors and roasting definitely winter-fy this! Well, my friend, you've done it again. We made this for dinner last night and just about licked our bowls clean. The roasted veggies were so so good! Thanks for sharing! Yay, so glad you loved it!! This was very good, used smoke Gruyere instead of Gouda and added cranberries! Yum, those sound like great additions! Definitely will try adding some cranberries next time!